Timing in business is everything. Ayds dietetic candy was a great selling product until something came along named AIDS and no one wanted to try a candy with weight loss when there was a deadly disease that triggered rapid weight loss. Timing was everything about Father of the Pride, an ambitious DreamWorks animation sitcom for NBC. 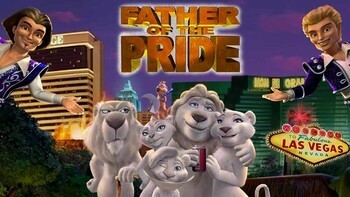 The idea about doing a cartoon about white lions that were the stars of Siegfried and Roy’s show in Las Vegas came as a result of Jeffrey Katzenberg visiting Siegfried and Roy’s Secret Garden at the Mirage Casino (which I recommend and has nothing to do with the fact that my family and I met Siegfried) in 2002. The sitcom needed 200 animators and cost more than $2 million an episode. It featured celebrity voices like John Goodman, Cheryl Hines, Danielle Harris, and Carl Reiner. It took two years to create and it was ready to bow in 2004. The only problem was timing because in 2003 during production, Roy Horn was mauled by a white tiger on stage at Siegfried and Roy’s show at the Mirage. Roy suffered near-fatal injuries and so incapacitated, his career was practically over. So a year later, the show bowed. With Siegfried and Roy as characters in the show (with actors voicing them), one could only think of Roy’s tragic mauling and I think it took so much out of the show. No one wants to laugh about lions when you think of Roy being attacked by a tiger. There were thoughts of not airing the show, but millions were spent on the production and probably in 2004, there was maybe some hope that Roy could recuperate. Siegfried and Roy wanted the show to air because who wants to pull a Network show where their act is the main plot of the show? The show actually started well in the ratings, but the 2004 Presidential election and odd airing coupled with less than favorable reviews, did the show in after 15 episodes.